A Little Boat Ride....Offshore on Inle Lake - a little adrift jr. 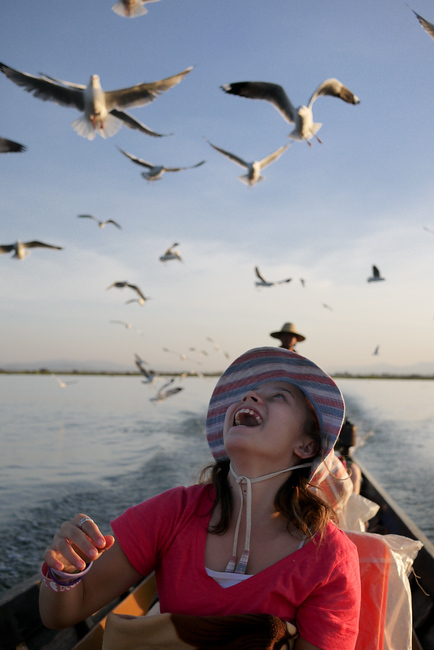 In Burma I went to visit a place called Inle Lake, and there I went on an exciting boat ride. When I first stepped foot on the narrow, wooden long-boat, it was really early and so cold that I was wearing three shirts! The boat had big comfortable seats, blankets, and umbrellas on the sides in case the sun got in our eyes later. As I got on the boat, I saw other boats going by us, and there were a lot of people on them with smiles on their face. I knew this boat ride was going to be fun no matter how early and cold it was. 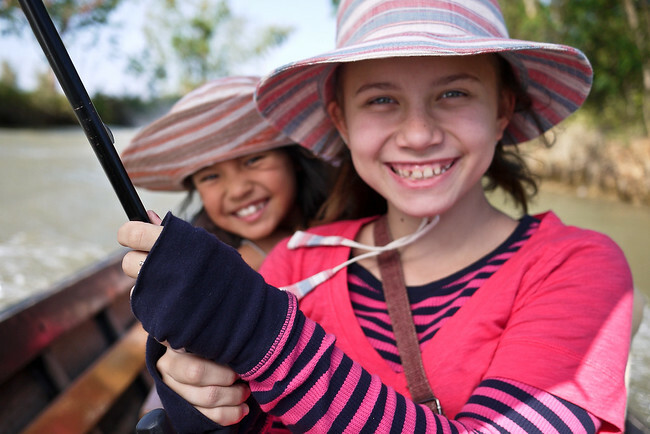 My friend M and me in our long-tail boat on Inle, with our sun umbrellas! When our boat first started sputtering and trotting down the canal toward the lake, there was nothing else on the water except for houses and stores to my left and cattails on my right. (Because of all the houses and stores near the lake, when I first got there I thought that a flood had just come through!) After seeing a long row of stores and cattails together on the canal, we came to the lake, and there was nothing surrounding the boat except lots of water. Then, suddenly, we saw a flock of seagulls coming toward us and we knew it was time to get our bird food out that we bought before getting on our boat! As soon as we got the bird food out, we broke off bits and threw food to a group of about 30 birds; the food was pieces of something that looked like a dried onion ring. It was so amazing! The birds followed our boat 10 minutes, and when we threw pieces of food really close to our heads, it felt like they were about to sit on our hair. 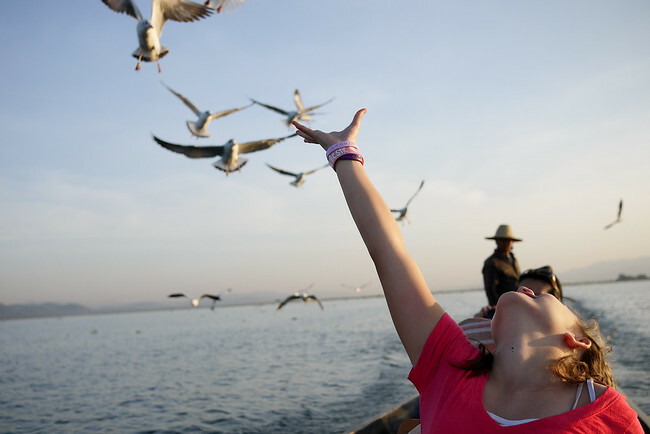 I was so excited to throw food up to the flock of seagulls above me, following our boat! At one point, I guess we fed them too much because all of a sudden, I felt something hit my leg and it was liquidy white and clear poop, about 5 minutes after that, I heard a loud “EWWWW” coming out of my aunt and there was a big splat of white and green poop on her leg! When we eventually ran out of food, which felt like 5 minutes but really was longer, the birds flew away. And just then we came upon the floating market on Inle Lake. As we were about to go into the boat parking lot, two women with a boat full of accessories grabbed our boat, along with their boat, until the two stopped together. Then, my aunt, my friend M and my friend’s mom started looking at all the weird jewelry that was neatly laid out in the middle of the boat on small tables. It was really funny because if you turned your head and the two women thought you weren’t paying anymore attention to them, they would say “hello” really quickly to get your attention and they said it in a questioning voice; I thought it was pretty cute and fun to have the market in the boat just beside us. 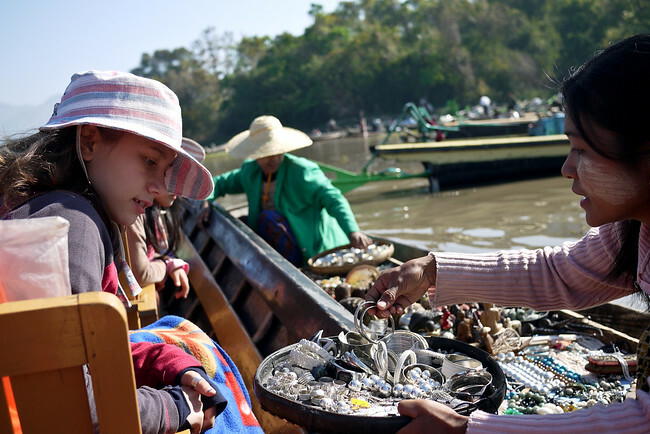 Buying jewelry from the women holding our boats together. After we bought a couple souvenirs, our driver parked the boat and we went to the actual market. The market was huge and filled with a bunch different people. Burmese vendors and people from the different ethnic groups were buying and selling things like food, jewelry, string puppets and a lot of things made of mother of pearl and wood that you could hang on your wall. 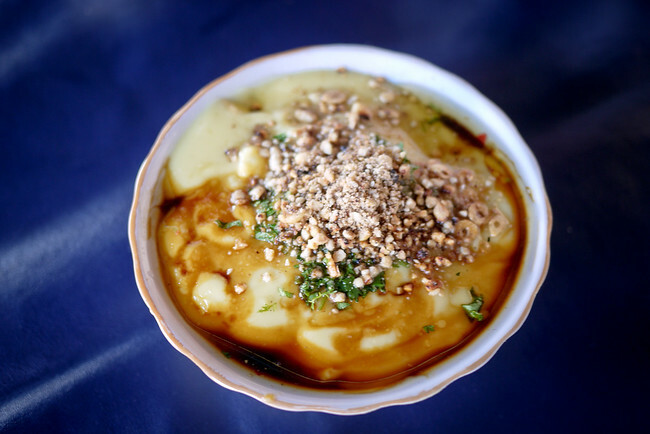 The delicious Shan soup, we had it for breakfast, and it is made out of liquid, ground split yellow peas, with nuts. After a delicious bowl of tophu nway, a Shan noodle soup from this region of Burma, we went and looked around in the market and then bought a humongous bag of bird food to feed some more birds when we were back on the lake. 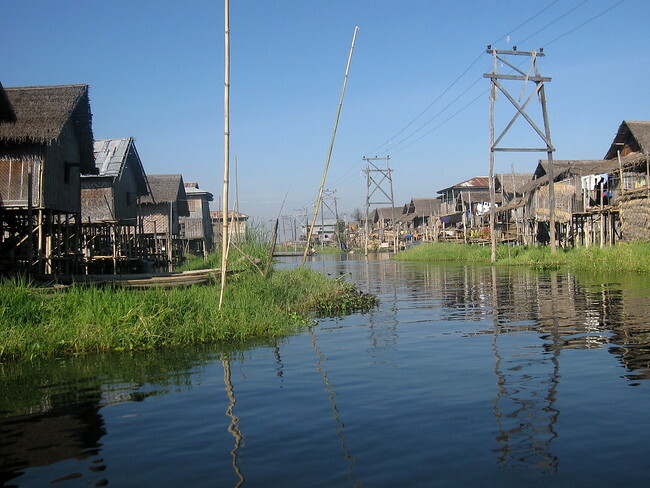 The stilt houses right beside each other on a small canal on Inle. As soon as we left the market, we saw a million houses in stilts. Houses that were big, small, tall, short, anything you imagine a house could be that was made out of bamboo sticks and woven wood. Near all the houses, sticks poked out of a large area of grass and seaweed. My aunt was wondering what it was so she asked our friend, and the guide explained that the sticks were there to keep the gardens in place because other wise they’d float away! The floating gardens held on the lake with wooden sticks. I thought this was really neat because I’ve never seen people who had to be worried about their food supply just floating away into the middle of a lake. They kept everything in place with 10 ft. tall sticks on their floating gardens. After learning about the fascinating gardens, we went to a couple temples that also seemed to be in the middle of nowhere on a huge lake. We stopped at a restaurant, and while leaving our lunch stop, we saw fisherman rowing with one arm and one leg! To row, the fisherman held the back of the paddle and then put the pole behind the heel of his foot, all while balancing at the front of the boat, and then he would just row like it was easy. It makes sense, though, because your legs have really strong muscles in them and are two to three times as strong as your arms. It was so cool and it’s the only place you can really find people who row and paddle just like that in the whole world. The fisherman on Inle rowing with just one leg and a paddle. After our tour to see the rowing fisherman, we were heading towards a spot to catch the sunset and on the way, we saw a teacher and about 15 kids following her and all the kids had their circular and tin lunch pails with them. It was amazing to see that because you have to think, a lot of kids don’t like going to school and complain about it, while these kids were following their teacher around in a garden holding everything they have to be able to learn. After passing the group of kids and their teacher, we came upon another flock of birds, also seagulls, but this time there were about 20 more in this flock! Throwing the food to the birds chasing me was SO much fun! Since we learned our lesson, we decided to keep feeding them except we covered our heads and body with the blankets on the boat. 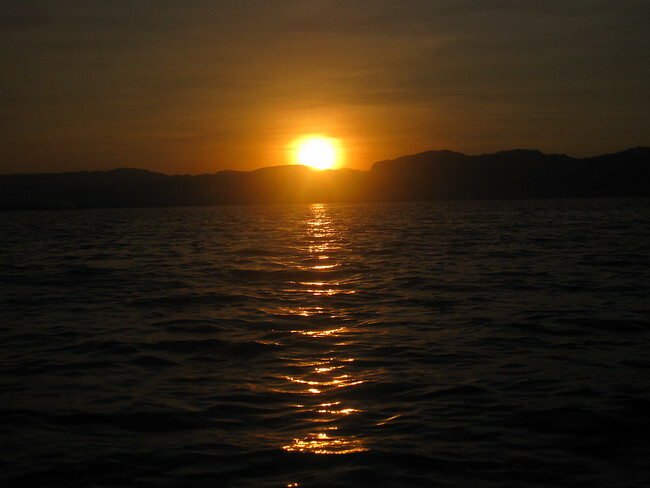 At about 5:30 we stopped the boat in the middle of the lake and watched the sun slowly dip behind layers upon layers of mountains. The sky was orange, pink and red while the sun looked like what it actually is, a ball of hot fire and gas. It was so beautiful, maybe one of the prettiest sunsets I’ve ever seen. The beautiful sun setting behind the mountains around the lake. 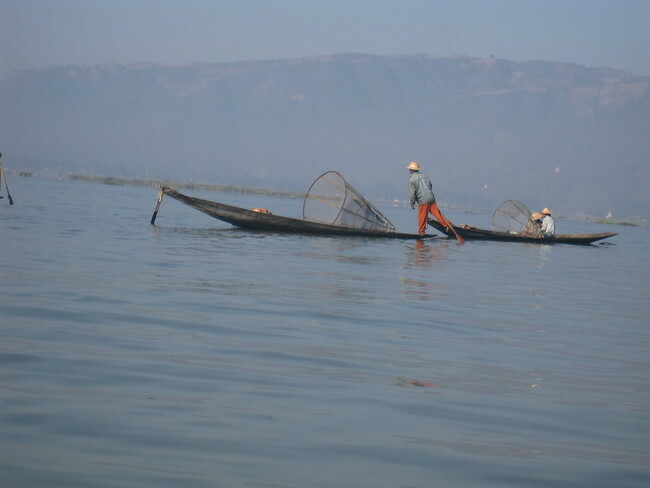 The people who live on Inle Lake must have a fun but hard life. I mean, you would have to learn how to swim probably by the age of two. I saw a couple of girls wrapped in a longyi and they bathing in the water right on the canals. The people also have to worry about your food floating away! 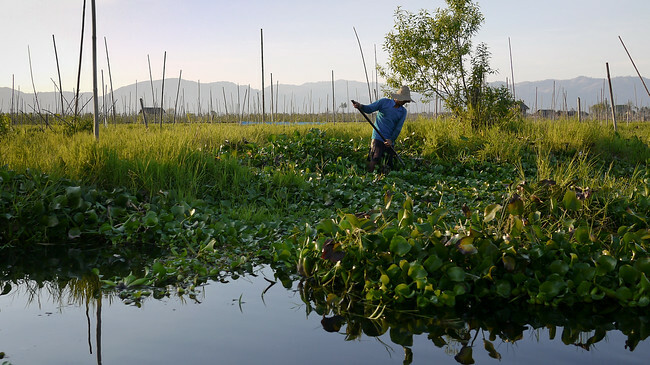 While there are hard things that come with living on a lake, there are also some really great things like feeling what nature actually feels like, a spectacular sunset everyday and the people of Inle Lake get to see everyday what only a couple hundred people out of nine billion people get to see. Inle lake wasn’t like any other place in Burma, although I guess some things were the same because the people there were still very, very nice like everywhere else we went! What ana amazing experience you have had! I would love to go to Burma- hopefully in a few years (when my wife lets me out of the country again :-) ) It will be easier to go there! Yes, when your wife lets you out of the country, Burma is one of the countries I HIGHLY suggest. And I think that Burma will probably be so much easier to go to in a couple of years, especially with the way things are changing currently! It gives me great pride to learn that there still are young people like you that appreciate and respect others and their cultures. Your family must be very proud of you and kudos to your aunt for giving you such priceless experience. Do keep it up. As a Burmese, I can tell you what my elders have taught me…you being respectful of others will bring you success in all your endeavors big or small. May you be free from harm, may you forever be bless, and may the kindness in your heart shine light on all those that you encounter. I hope you visit Burma again very soon. I wish you all the best in your future and your future adventures.